I should say up front, this is going to be a pretty esoteric one. It's just that this is something I spent a fair chunk of a morning trying to work out, and I may as well put what I found up here in case someone else finds it useful. A few weeks back I found myself, as one does, trying to sort out the exact publication date of early numbers of the Bulletin des Sciences, par la Societé Philomathique de Paris, which has been archived online at the Biodiversity Heritage Library. 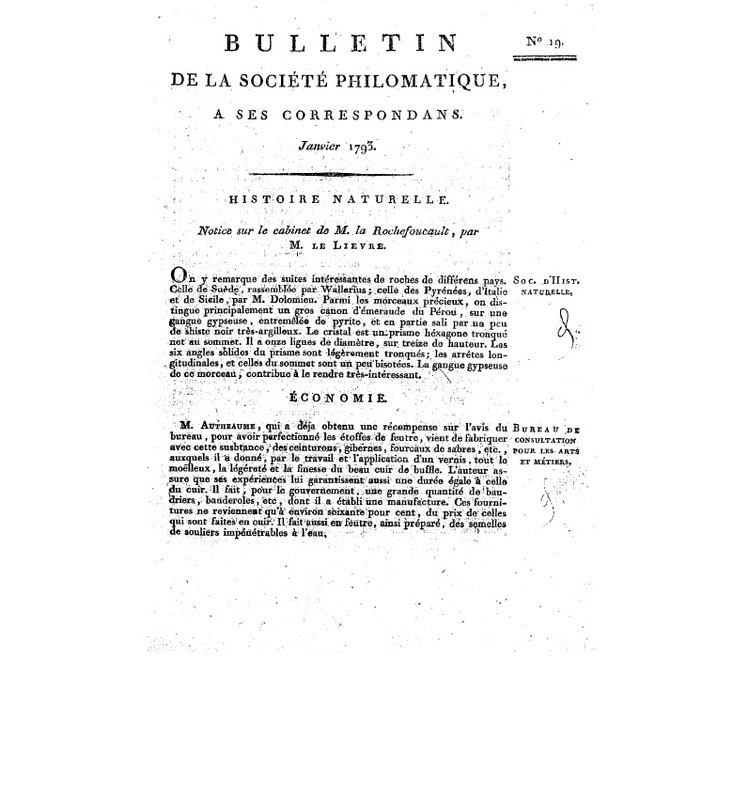 The Société Philomathique was an association of French scientists and polymaths from a wide range of disciplines founded in 1788. You can find the webpage for the current iteration of the Société here. 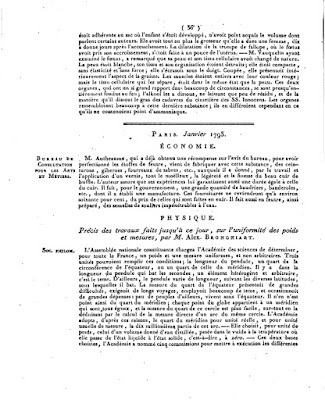 In 1791, the Societé decided to circulate a bulletin of abstracts of their meetings, including summaries of papers and letters presented there. 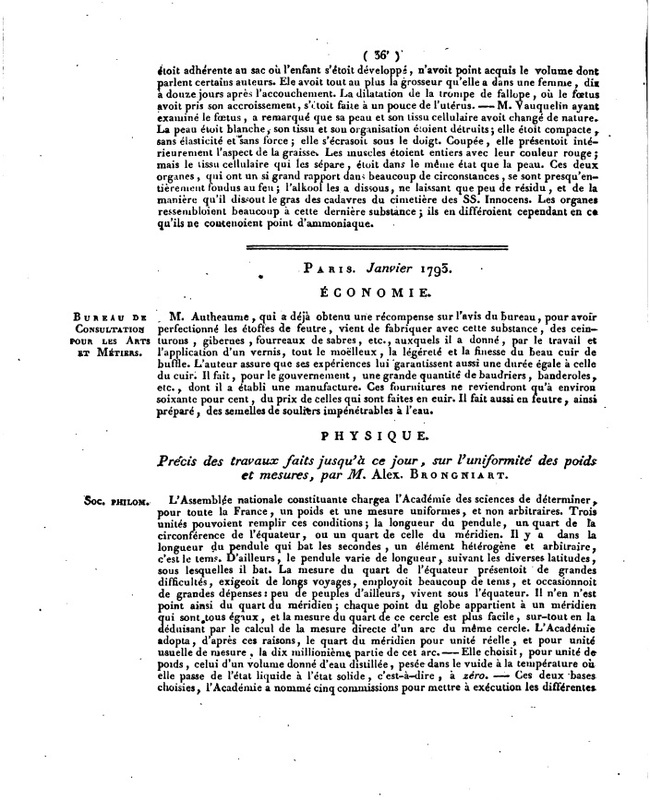 The title page of the volume of the Bulletin available at the Biodiversity Heritage Library gives the dates of "Juillet 1791, a Ventôse, An 7", or July 1791 to February–March 1799, which is the dates of the meetings presented therein ("Ventôse, An 7" is a date in the Republican Calendar that was introduced for a period following the establishment of the French Republic in 1792). Citations I could initially find for individual notices in the Bulletin were all attributed to dates of the separate meetings that they were presented at (e.g. something presented at the May 1794 meeting would be cited as "1794"). But it was immediately obvious to me that the notices could not have been published at the times of the original meetings, at least not as they appeared in the volume reproduced, because abstracts from separate meetings would appear on the same page! Hence my search for information on the Bulletin's actual publication date: were notices for individual meetings issued separately at the time, or did they not actually appear in print until the subsequent publication (presumably in 1799 or even later) of the collected volume? I should note that some of the abstracts in the Bulletin included descriptions of new species, so the question of publication date could have further taxonomic implications. A page from the collated Bulletin, showing how the last entry for the December 1792 meeting is followed immediately by the section for January 1793, without a page-break for originally separate issues to have been collected together. Eventually, I was able to establish that separate Bulletin issues had indeed been released for each meeting (you can see reproductions of the uncollated originals at Gallica). However, there is a complication. Early issues of the Bulletin were written by hand, and distributed only to the members of the Société (about 18 people at the time). It was not until November 1792 that a printed version of the Bulletin began to be disseminated more widely. Now, the International Code of Zoological Nomenclature requires that any publication for taxonomic purposes produced before 1986 must "have been produced in an edition containing simultaneously obtainable copies by a method that assures...numerous identical and durable copies" (Article 8.1.3). A handwritten manuscript would not meet that requirement, so any zoological name appearing in those early bulletins would not count as published. They would not become established until the subsequent publication of the collated volume, which according to an introduction written by Jonathan Mandelbaum in 1977 for a bound collection of the original Bulletin issues (reproduced at Gallica here) happened in 1802. Original first page of the Bulletin for January 1793. 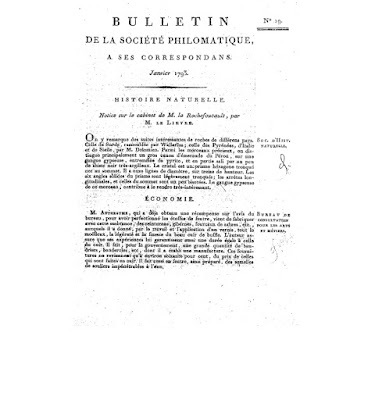 As well as the separation from the December entries, note that the first entry of the original version has been omitted from the collated version, and that the title's original spelling said 'Philomatique' rather than 'Philomathique'. As an example of the sort of consequences that might arise from this, consider Odiellus spinosus, a widespread harvestman species found in western Europe. This species was very briefly described, as Phalangium spinosum, by Bosc in 1792 in one of the manuscript issues of the Bulletin de la Societé Philomatique (the February 1792 one, to be exact). This has uniformly been accepted as the publication date, but Bosc's species was not properly published until 1802. This might be a simple question of book-keeping, were it not that, in the meantime, Latreille (1798) had used the name 'Phalangium spinosum' for a quite different harvestman species, and described what is now known as 'Odiellus spinosus' under the name of 'Phalangium histrix'. So strict application of the law of priority means that the species in question should be known as Odiellus histrix. Fortunately, in this case there may be some loopholes available to us. Latreille's names both have strict priority over Bosc's, but they may each count as nomina oblita ('forgotten names'). This is a provision in the ICZN that a name that has not been used as valid since before 1899 can be set aside in favour of a more widely recognised junior synonym if "the junior synonym or homonym has been used for a particular taxon, as its presumed valid name, in at least 25 works, published by at least 10 authors in the immediately preceding 50 years and encompassing a span of not less than 10 years" (ICZN Art. 23.9.1.2). Latreille's Phalangium spinosum was soon recognised as a synonym of an earlier name, and was last used as valid in 1802. Phalangium histrix (or derived combinations thereof) persisted in the literature for longer, but I haven't come across it being used as a separate species after 1876. The open question is whether Bosc's name has been used often enough to warrant automatic conservation. I suspect it would have (I haven't done a proper tally myself, but a search for 'Odiellus spinosus' on Google Scholar brings up about 130 results) but, if not, then an appeal to the ICZN would be required if we wanted to keep using the current name for the species. Well, it's a change from worries about what sorts of electronic publication count! Tangential to the topic. It didn't involve a nomenclatural act, but I once published an article in a journal whose publication schedule had slipped drastically: the year of publication on the cover was at least one earlier than the year of actual appearance. That sort of publication slippage must happen in zoology. How do you cope with it in figuring out priority? It's certainly far from uncommon (cases where the actual release is two or more years later than the date on the cover are rarer, but also not unknown). I've also known cases where the inverse was true: the date on the cover was actually later than the date the journal was released. As far as priority is concerned, in theory, only the actual release date matters. The problem is, of course, that there's often no way of knowing after the fact if the actual and claimed dates don't match. Even in the case I was discussing in the post, I've been referring to "January 1793" and "February 1792" issues and the like. Those were the dates of the meetings that the bulletin issue was reporting on; I've got no idea what the lag time was between the actual meeting and the appearance of the corresponding issue. The ICZN explicitly states (at least in the recommendations) that any evidence can be considered when trying to establish the actual publication date of a publication. For instance, most libraries will stamp a new book with the date it was added to collection, which may give an upper limit to the publication date. As a side note, when it's not clear exactly what date a publication was released, then the latest possible date is assumed. For instance, if we can say for sure that a book was published in 1793 but can't say when that year, then we assume the date was 31 December 1793. Any new species in that book would lose out in priority to one that we can demonstrate was published in, say March 1793. Similarly, if we can't say what day in March the latter species was published, we assume 30 March 1793 (and yes, there are cases where establishing priority can come down to establishing just which day of a month a publication was released).